Workspaces are great for categorizing your videos into different buckets and are especially powerful if you're working on a larger team with multiple ongoing campaigns. Workspaces are also very useful when creating videos for multiple clients, as they allow you to separate your videos into different dashboards. 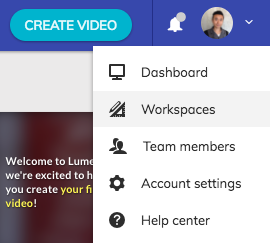 You can access the Workspaces page from your Lumen5 Dashboard by clicking on your profile icon in the top-right corner, then selecting Workspaces from the dropdown menu. 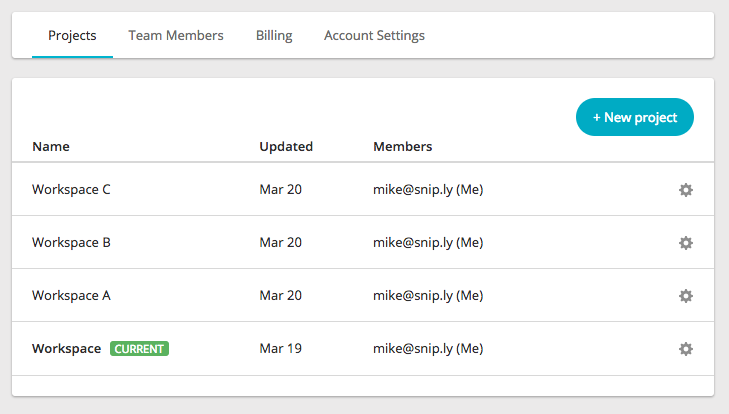 On the Workspaces page, you'll be able to create new Workspaces and see a list of Workspaces you have access to. If you're an admin, you'll also have the ability to change the members of each Project using the gear icon. If you have access to multiple Workspaces, you'll see a dropdown option available near the top-left corner of your dashboard.